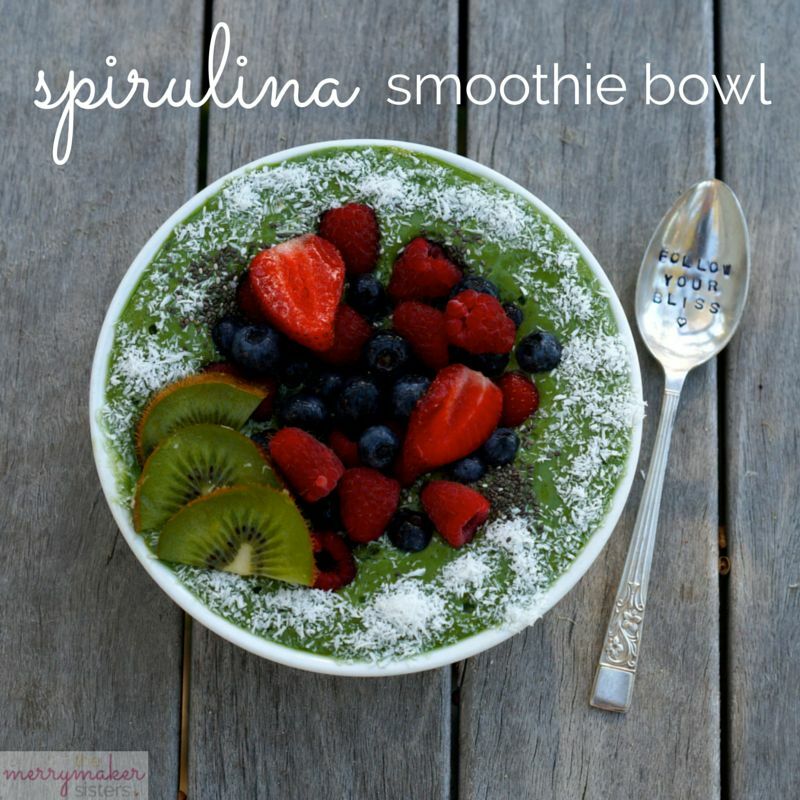 Spirulina Smoothie Bowl | Get Your Greens! We’ve been talking about adding spirulina in to our daily merrymaker-ness (that’s definitely a made up word) for a while now. Ever since someone said to us: “oh, you girls should try spirulina! It’s like liquid sunshine!” we have been meaning to give the green powder a whirl! We LOVE the sound of liquid sunshine and we’re huge fans of getting more nutrients and vitamins in to our bodies at every single meal. Merrymaker Dad took this photo! Go Dad! Why should I eat/drink spirulina? Spirulina has anti-ageing properties! Thanks to the high amounts of beta-carotene (in fact… 20 times MORE than carrots! Move over carrots!). It’s anti-inflammatory! Well… you had us at anti-inflammatory! Spirulina is full of chlorophyll which helps detox the body of toxins and heavy metals. Spirulina will boost your immunity! Boom! LOVE THIS! Spirulina is a great source of iron! It’s going to give you energy that lasts! Believe it or not (no, believe it, it’s true) spirulina has 5 times more protein than eggs. Our favourite is that spirulina has 10 times more calcium than milk! So the next person who asks us where we get our calcium from when we eat paleo… we’ll be giving them some spirulina to try! This week, we’re down the coast with our parents taking some time to recharge and reconnect with the earth’s magic! While picking up our groceries, we threw some Nature’s Way Organic Super Spirulina into the trolley. We couldn’t think of anything better than to whiz up this Spirulina Smoothie Bowl for everyone to get their daily dose of liquid sunshine! 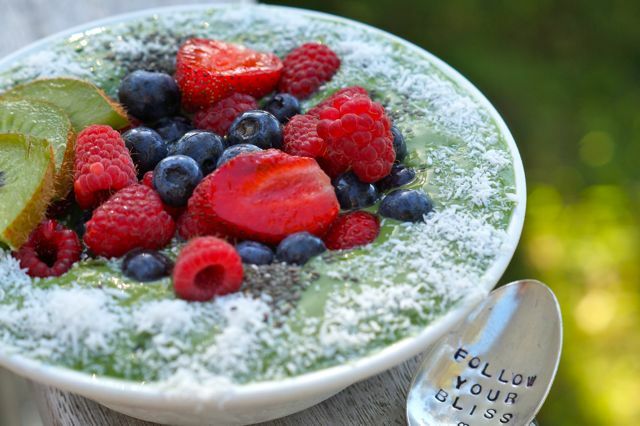 It even got Dad’s tick of approval… which means that this Spirulina Smoothie Bowl is totally delish! Do you like/love spirulina too? Load us up with your recipe ideas, just leave a comment below! We want to get green and creative! Your favourite fresh fruit and toppings! In a blender (we use our Vitamix) place all the ingredients (except the toppings!). Whiz on high speed until super duper smooth. 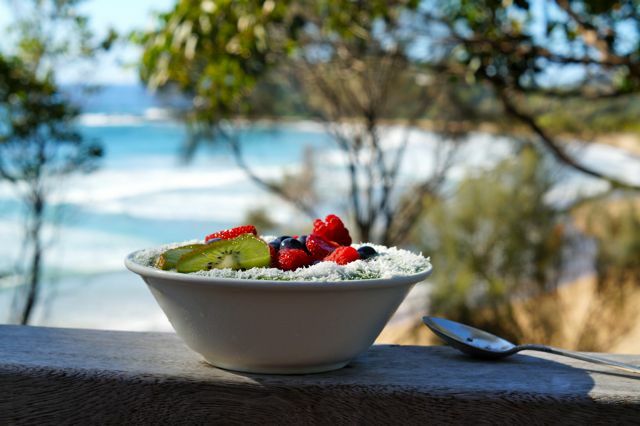 Pour in to 2 bowls and top with delicious things like berries, coconut, chia seeds and kiwi fruit! Try adding a tablespoon of raw cacao powder for a chocolatey hit! Yum! Sending huge love and hugs to our recipe sponsor Switched on Media! Read more about our Advertising and Sponsorship policy here.